You should publish this on the ecosystem..
on the get 360 Triggers? if not, can you make it that way so that get left trigger and get right trigger are not needed anymore? Thank you darkhitori for these actions. 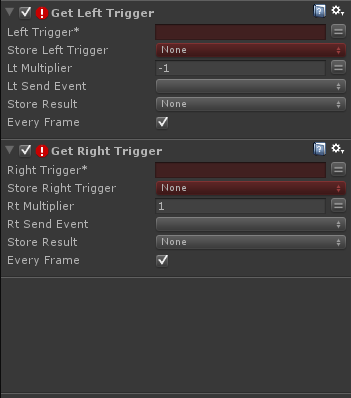 I have been trying to use the Get Left Trigger and Get Right Trigger actions, but when I use the Get Left Trigger action with the setup you suggested (in the input manager, I set the Left Trigger to the 9th axis and invert it), the Left Trigger on the control does fire off, but it causes my character to move backwards. Is there any explanation as to why this might happen? Again, thank you for these actions. Well, the trigger buttons are working now. 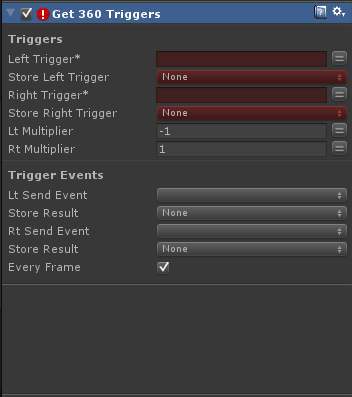 I closed Unity, and when I opened the program again, the trigger buttons started working perfectly.